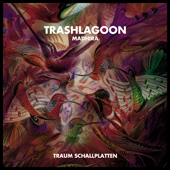 The German duo Trashlagoon has released on our Tour De Traum flagship before as well as on the French label Délicieuse Records. For us they have added a new twist to their tracks and they say that these might the best songs they have written so far. The duo originates from Düsseldorf and Trashlagoon conserve the historic influence of that city on electronic music in terms of a highly artistic and modernistic approach to their music. 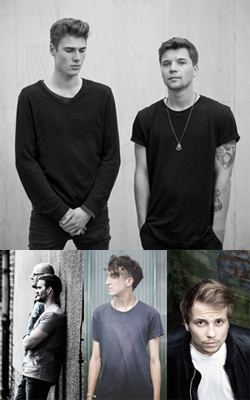 They name James Blake as a source of inspiration and have with their move to Berlin also found a friend in fellow musician Parra for Cuva. Trashlagoon have developed a technique that enables them to blend piano with guitar and vocals and herewith they have created a modern collage! Their music is enchanting, captivating and when they juggle with their diversity of elements, that struggle always ends by magic in perfect harmony. "Marouki Knows" is a musical journey that could be coined a "fairytale on horseback", where two people get carried though cobble stone alleys on a starlit night, wondering why the stars are glued to the firmament. Trashlagoon connect with skill tiny disturbed moments with those of a pleasant surprise. „Oh là là“ we say to ourselves when we think about their hi-tech language tied to a horse back. How much more surreal can you get, Trashlagoon? "Secrets Of Asura" in comparison kicks off with a sequence that sounds like an updated version of Berlin's techno hymn "Klang Der Familie" but then throws puffballs at us instead. Slowly the track is transfixed into an exotic dream where we can enjoy the pleasures of an Arabian night, a world full of imagination. Before we try to make sense out of this the track is over and laves us stranded like fish on the shore. What happened here? "The Undertow" describes a darkish and mechanical world and is unlike anything you have ever heard from Trashlagoon. Maybe this is a piece of techno music most obscure, but we are not sure. There is no beginning and no end when "The Undertow" transfixes us. "Ama Dablam" keeps you warm on cold nights, a piano, a campfire, but beware the track undergoes a strong change at times encompassing two sources at the same time, working here with a more absolute collage technique. With Microtrauma one of the top artists on Traum return here with a remix. They have chosen the most complex and surreal track of the EP "Ama Dablam" and have transformed it into something leaner still electrifying, bold, stark and visceral. Their percussive energy is unparalleled and here at its best. It is in tune with a harmonically complex and coherent musical torso that acts graceful as well as muscular. This remix should embrace the dancer with its kinetic catchiness. Parra for Cuva remixed "Marouki Knows" and has worked towards a listening version with an indie band profile, working with subtle feedbacks and drone sequences, all dense layered and beautifully atmospheric! Emde with whom we have releases on Tour De Traum and on MBF LTD has remixed "Ama Dablam" with his approach towards deeper House that has already made his other trax so special. Expect nothing less than music which creeps under your skin. It is a must for all Broker/Dealer fans.